Online casinos are all the rage at the minute, even social network site Facebook rakes in $400million a year from social gaming. It is a lucrative pie that everyone wants a slice of. Online casinos have everything that a land based casino has and as such are growing in popularity daily. 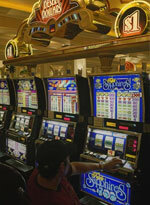 The slots account for up to 70% of Las Vegas casinos’ yearly revenue, making it the most popular game with gamblers. So which is better, online or land based slots? There is a lot more variety with online slots. 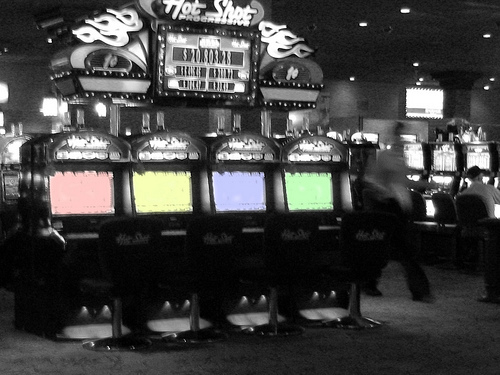 Land-based casinos have a finite amount of room allocated for slot machines, something that is not a problem for online casinos who can have an infinite amount of slot machines. If you were to play now at the 32Red online casino you would have access to over 130 different slots, that sort of variety cannot be found on land. Another advantage of the online format is that you can always play your favourite slot machine. Per se that your favourite slot machine was Big Break, online you could play at any time but if you were to walk into a land based casino and saw someone on the machine that you want to play, you would have to wait patiently, a million people could be playing Big Break online and you still wouldn’t have to wait. Due to the lower overhead costs of running an online casino in comparison to a land based casino, you can find higher pay-out percentage online. If the difference between the two formats was around 5% you may not be that bothered, but they are not. Online casinos pay-out percentages range from 92-97% whilst land-based slots are somewhere between to 70-80%. That’s a difference that is hard to ignore. On the other hand though, land based casinos are not without their perks. You cannot get hot machines online. With land-based slots you can watch someone load up a machine and then swoop in and take their money if their efforts prove to be fruitless. This does not happen online as the slots do not account for other players. Slot players also know that when a slot is paying it’s paying, this is not found online. Playing the slots in an actual casino is also a lot more social, you are surrounded by people, while playing online is usually a solitary affair. It is a trivial point but a point nonetheless, playing online slot machines does mean that you cannot have free drinks, something that is the norm in most land based casinos. Both versions of the slots are good enough to saturate you demand to play it. They both have their advantages, as well as cons. Neither are perfect but both are fun. It really is a matter of personal preference.